Natural perfume in a 4,5 ml ( 0,15 American oz) square glass bottle. The aroma is shimmering with all shades of amber, it warms and relaxes. 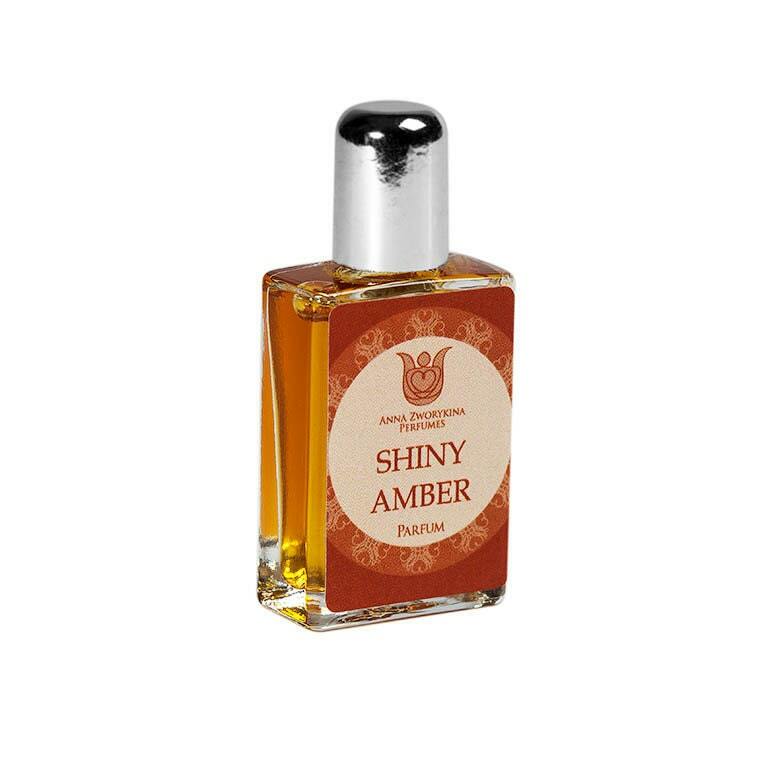 If dubbed, the perfume comes as rich and dence amber scent with a bright sweet start. Eau de parfum in spray-form is airy, light and very warm, like a cashmere-silk shaul. Shiny Amber could be the ideal choice to wear when the weather is nasty and gloomy. And it smells magnificent when it’s really cold! Fallen leaves- Natural perfume, Balsamic and woody fragrance of autumn, with cassia, immortelle, cardamom, vanilla, vetiver, Flacon. Morocco- olfactory art in a bottle, floral oriental fragrance with jasmine, roses, cardamom, frankincense and vanilla Flacon. Chypre lovers sample set: 6 samples 1 ml of artisanal olfactory art in a bottle Chypre type with bergamot, oakmoss, labdanum. What a blast! Fantastic dark-roasted coffee bean and orange zest start dries down (sadly all too quickly on my skin - I'll definitely get the parfum next time) to a still edgy dark chocolate skin scent that has me constantly pressing my nose to my wrist, chasing the sugar. On a prosaic note, the scents arrived incredibly quickly, safe in a little tin, with two samples, both of which are equally fascinating in their development. Ms Zworykina is truly an artist. Even more dense and beautiful in parfum form, I could not imagine Cuir de Russie could get any better. It’s great that I need not just imagine. Morocco-olfactory art in a bottle, balsamic and floral oriental fragrance, with jasmine, roses, cardamom, frankincense and vanilla Flacon. White silk - olfactory art in a bottle, Oriental floral fragrance with bergamot, rose, jasmine, osmanthus and sandalwood, Flacon.